A square like no other in the world: an open air museum and a window on history, this is Piazza della Signoria. The square has been and is Florence political center, it has been defined by centuries of struggle for political power by Florentine families and parties, till the Medici claimed absolute power in the 16th century. Leaning over the Square, the seven centuries old Palazzo Vecchio and its high tower, Arnolfo Tower, is one of the world’s most recognizable medieval buildings. A touring experience set in a very small space but that will impress you with the history and art in each detail of the Square, Without having to walk more than a couple of minutes, you and your group will acquire all the information necessary to understand the history and the politics in Florence while enjoying and learning about the art around you. Experience an open air museum! Meeting at your hotel or an established location. 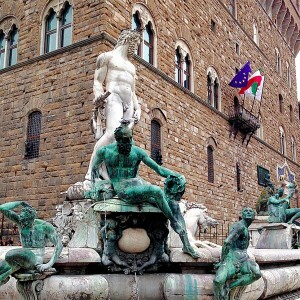 Walk to Piazza della Signoria and start with an urban architectural introduction. Continue with potilical facts and learn about the continuous struggle over power from the 13th to 16th century in Florence. 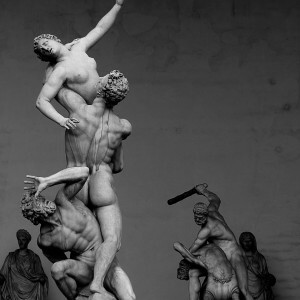 Focus on original art present in the Square by great masters such as Giambologna, Cellini, Ammannati and replicas of art by Donatello and Michelangelo (the David) and many other artists. 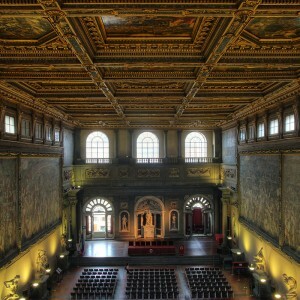 Continue the tour inside the Palazzo Vecchio, starting at the interior courtyards and then visiting the first floor and the breathtaking Hall of the Five Hundred, a majestic chamber, 52 meters (170 feet) long. On the second floor, you can admire different interior spaces, apartments and chambers, that have been remodeled in the 16th century, when the Medici lived in the Palace, by artists and architects like Vasari, Ghirlandaio and Bronzino. On request, follow up with a tour of the adjacent Uffizi Gallery. Schedules | Daily except on Thursday. For opening hours and other information, please check the Musei Civici Fiorentini official website.